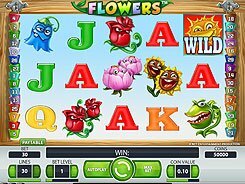 Flowers is an easy-to-play video slot from NetEnt featuring 5 reels and 30 paylines. The slot is themed around flowers and the symbols set incorporates bellflowers, sunflowers, roses, and other themed icons as well as standard playing cards from Jack to Ace. The adjustable betting options used in the game enable you to place a stake anywhere from $0.01 to $75 per spin. 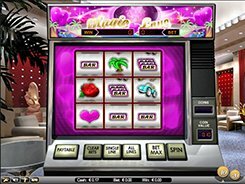 The slot features a scatter, a wild, free spins and a unique Double Symbols feature. Flowers may appear on the reels as single or double symbols. Every double flower counts as two single flowers, so a winning combo may contain up to 10 matching symbols which offers the potential for bigger cash prizes. A wild symbol depicted by the Sun substitutes for all single symbols and pays out the slot’s jackpot worth $12,500 for five of a kind. A scatter can also appear as a single and double symbol, with these four activating up to 30 free spins with all payouts tripled. The second-largest jackpot of $5000 is paid out for the Rose symbol if ten of them land on an active bet line.